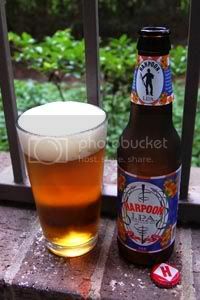 While I started my Harpoon experience with their Summer Beer, they are best known for their IPA. Brewed for over 15 years, it's one of the longest-running versions of the American IPA style on the market today. The high hopping of Harpoon IPA is not only noticeable in the nose but especially in the finish. The lingering bitter finish of this beer is not harsh or astringent, but crisp and pronounced. This is created, in part, by dry hopping. This beer is floral, medium body with an aggressive, clean hop finish. With so many years passing between this beer's original launch and the craft beer climate of today, I'm curious to see how it stacks up. Appearance: An orange-amber body with two fingers of sudsy, off-white head. Good lacing. Aroma: Citrusy Cascade hops over sweet pale malt. Good stuff, but perhaps more in line with a straight-up Pale Ale, rather than an IPA. Taste: Up front, a mild wave of citrusy Cascades sets the tone. Underneath, the malt backbone is more than able to meet the hop challenge, making for a very balanced proposition. Once again, this smacks more of a great Pale Ale rather than a full-fledged IPA. The aftertaste is mildly bitter and a little grainy. Mouthfeel: Medium-bodied with good carbonation. Dries in the finish. Drinkability: Certainly above average for the IPA style, this makes for a wonderfully sessionable beer. Verdict: Certainly not the most hopped IPA out there, I really would have pegged this one as an Pale Ale if I had to guess. I guess over the years the craft beer world has just moved on from this definition of an IPA. But, putting style aside, this is still a tasty and highly sessionable beer—just don't go in expecting an excess of hops.